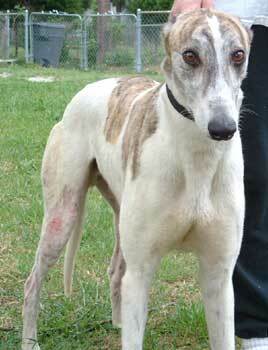 Cherokee, formerly Patrone, is a 2-year-old white-and-brindle big rangy laid-back guy, born February 2002. 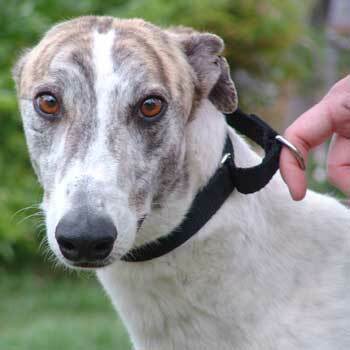 Cherokee, along with Apache, was one of the rescued greyhounds found in a horribly neglected situation in Muskogee, OK, April 12, 2004. Cherokee is being treated for Sarcoptic Mange. He LOVES his stuffies, especially tossing them in the air in the backyard. He is still reserved and a bit wary of people, but warms up fast. He crates well, walks on a leash just fine and is just a very agreeable hound. For a dog that just turned two he seems mature beyond his years.